Yes, this is Hawaii. 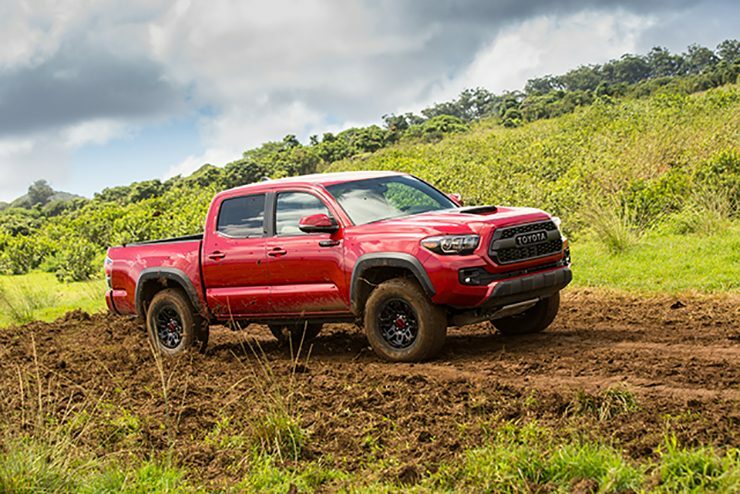 And yes, this is the 2017 Toyota Tacoma TRD Pro tearing up the dirt. 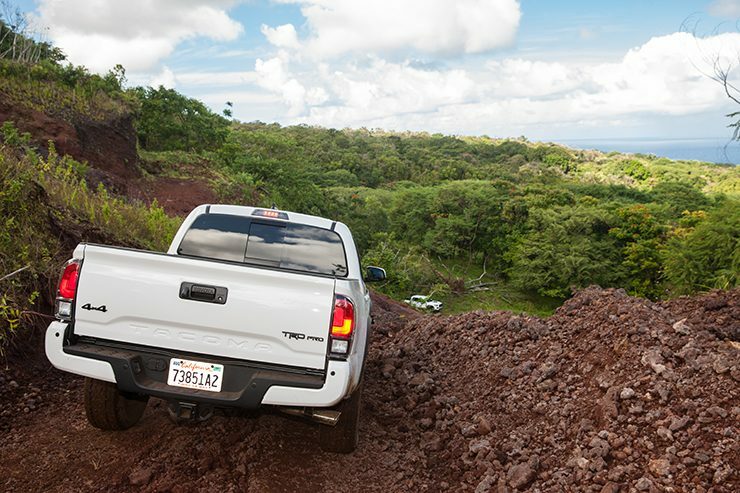 Toyota flew a select group of journalists to Hawaii to experience the all-new Tacoma on a private ranch in Maui, Hawaii. Why Hawaii? Turns out it is the best-selling vehicle (car and truck) in Hawaii. 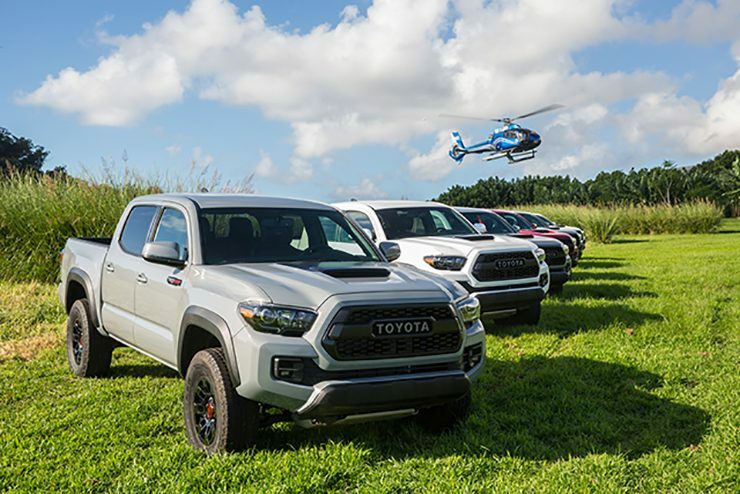 Toyota expects to sell just under 6,000 units there and while that may seem small it is quite large considering the population of the state of Hawaii is 1.4 million people (for reference Florida is around 20 million). The ranch was about a 2.5 hour drive from the hotel. Naturally, Toyota opted for helicopters to fly us across the island. Much quicker and with incredible views. 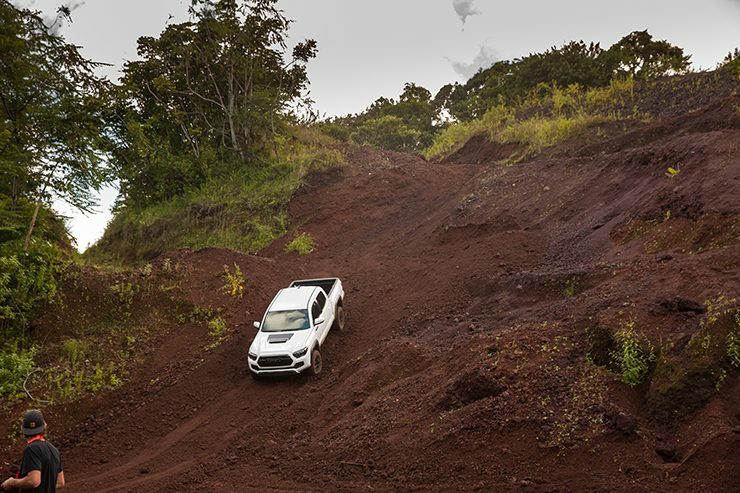 Another benefit of being in Hawaii was seeing how the truck handled the terrain. Specifically, we were on Maui which has a lava rock base with a thin layer of soil on top. With the moist climate of the ranch, rain quickly turns the ground into a muddy mess. And fortunately for us, the ranch had received a considerable amount of rain followed by sunshine creating the ideal conditions to get a little squirrely. During our day of driving, we got to experience the truck on an off-road race track, through a rocky creek bed and down a 41-degree cinder rock wall. Each setup showcasing what makes the TRD Pro a sought after truck. And by the way, Toyota is adding to the fervor by only building 5,000 units. What is the 2017 Toyota Tacoma TRD Pro? The 2017 Toyota Tacoma TRD Pro is basically a Tacoma Off-Road on steroids – a capable truck in its own right, but not THIS capable. It takes the best features of the Off-Road version and adds additional off-road goodies. 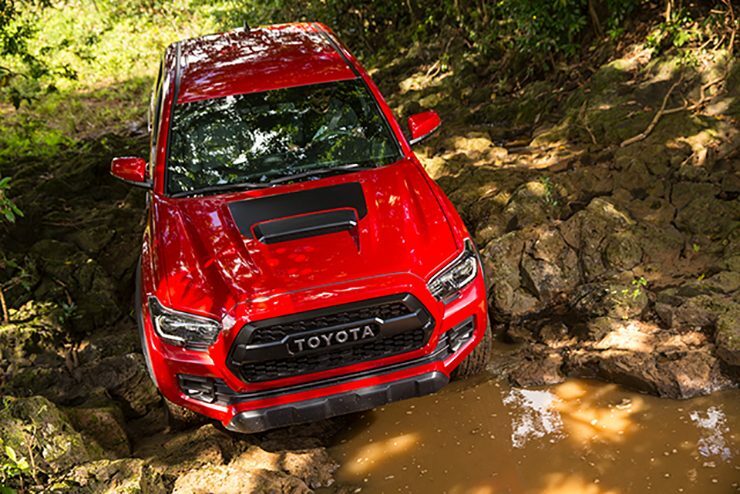 The base goodies include a locking rear differential, multi-terrain select, CRAWL control, FOX shocks tuned by TRD, Rigid LED fog lights, aluminum skid plate among others. This is a 41-degree Cinder rock wall. We used CRAWL Control to let the truck “drive” us to the bottom. Roller coasters don’t have anything on this wall. Taking things up a notch, the TRD Pro has a 1-inch wider wheel offset for additional traction, a larger sidewall tire for improved ride quality and traction, new (and the for the first time ever on a Toyota product) Rigid LED fog lights providing a vastly improved wide-angle beam of light over previous models, 2.5” FOX internal bypass shocks (another first for Toyota) with rear remote reservoir shocks providing a longer and smoother ride. Plus, their design helps to prevent capitulation of the oil (wearing down and not going up to the top of the shock) as well as their aluminum body reduces heat buildup. There is also a host of compression and rebound zones TRD engineers built into the shocks to provide exceptional support when tackling different obstacles and terrain. The view from the top of the Cinder rock wall. Also approach/departure/breakover angles are quite a bit different compared to a stock off-road 4×4 short bed Tacoma with 32.0/23.1/20.0 respectively for double cab vs. 35.0/19.1/23.9 for TRD Pro. Finally, the TRD-tuned front springs provide an additional 1-inch lift and tuned to be softer than the OEM springs for a better ride. A large front-sway bar also helps to improve the steering response for on-road driving. Oh and in case you think this truck is perfect, I would knock Toyota for the Tacoma’s interior. I think there are plenty of opportunities to improve the truck here as well with the radio head unit power output and infotainment system. Interestingly, I learned something new on this trip – the other benefit of 4 lo. Putting the truck in 4 lo allowed us to turn off the anti-lock brake and vehicle stability control which meant a lot more fun sliding through turns. We all left with smiles on our faces. Can’t I Just Buy the FOX Shocks Myself? 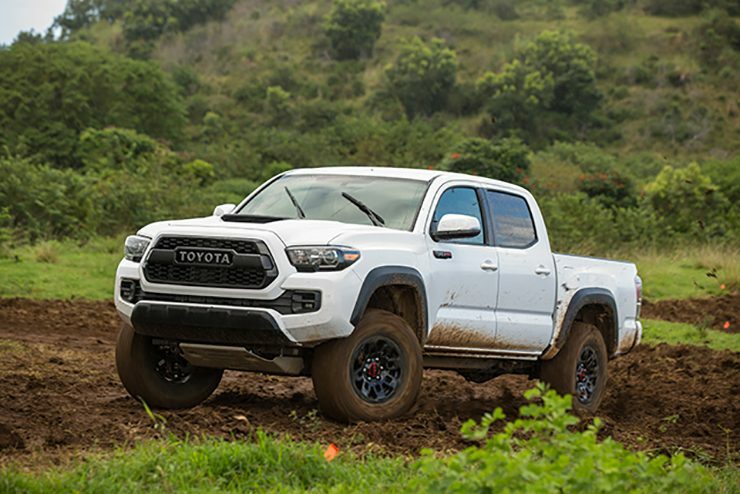 Many people make the mistake in thinking the TRD Pro Tacoma is just like any other Tacoma except with different shocks that can be easily be replaced with off-the-shelf options. They forget about the rest of the aforementioned package – the lift, exhaust, wheel travel and wheels/tires plus the interior treatments. Sure, you can purchase all of these separately, but then you miss all the work the Toyota Racing Development making sure each component works together in harmony. And isn’t driving a truck as fast as you want with each part working perfectly in sync together what it is really about? Finally, don’t downplay the other features like CRAWL Control, Active Traction Control, Multi-Terrain Assist, Hill Start Assist Control and the Electronically Locking Rear Differential found on the 4X4 automatic transmission models. It doesn’t really matter how good you are off-road (or think you are), you simply can’t replicate these systems. Considering getting stuck and/or breaking down is about as much fun as watching paint dry, why wouldn’t you want these features. Try these kinds of maneuvers with a stock Tacoma and off-the-shelf shocks. 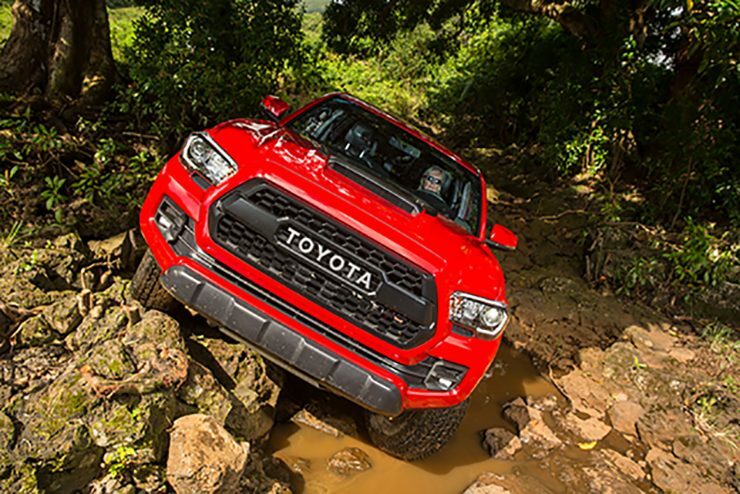 In the end, the 2017 Toyota Tacoma TRD Pro may have the same engine and transmission of other Tacoma models, but it is a wholly different truck. Quite frankly, I’ve done my best to beat up the other Tacoma trucks off-roading and I’ve pushed them to their limits. The TRD Pro had me calling uncle. Disclaimer – Toyota paid for the air travel, lodging and food for this trip.